Hildegard Moniac was born on March 29th, 1891 in Friedenau, Teltow. Grown up in Berlin, she passed her exam as vocational school teacher for tailoring and plastering in the Lette-association in 1911. This association offered, among other things, vocational qualifications for women. In the time between 1913 and1933 she worked as vocational school teacher in the Spree metropolis; there she was dismissed by the National Socialists as politically unreliable under article §4 of the so-called Civil Servant Act (Berufsbeamtengesetz). Since the end of the 1930s she supported her unwell long term partner Johanna Elberskirchen at her homeopathic practice in Rüdersdorf. The two women had got to know each other in 1914 and lived in Berlin until 1919. One year later they moved to Rüdersdorf and together bought a house there in the then 32, Luisenstraße. During the Weimar Republic, Hildegard Moniac was member of the USPD (Independent Social Democratic Party of Germany) and organized together with SPD (Social Democratic Party) comrades the Jugendweihe (youth consecration) in Rüdersdorf till 1933. In 1945/1946 she was active in the SPD (Social Democratic Party) until the politically controversial unification of SPD and KPD (Communist Party of Germany) to the SED (Socialist Unity Party). According to Rüdersdorfian contemporary witnesses, she later rendered a committed service in the SED for senior citizen's work. After the Red Army had left the building of the primary school Alt-Rüdersdorf which they had occupied since the end of the war, the school which existed since 1881 was reopened on October 15th, 1945 and was run by Hildegard Moniac. In 1951 she was transferred, in the interest of service, to the local vocational school. As background to her transfer, which was accompanied by protest on the part of parents, one can suspect political motifs connected possibly to her homosexuality. In 1954 she is said to have retired from school-teaching for health and aged related reasons. Until her death on August 3rd, 1967 at the age of 76, Hildegard Moniac lived with her later long term partner Luitgarde, "Luli" Kettner (1914-1977), who was, like her, a teacher at the Alt-Rüdersdorf primary school, in the house in the Luisenstraße. 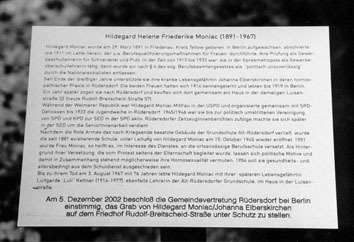 On December 5th, 2002 the municipal council Rüdersdorf near Berlin unanimously decided to put the grave of Hildegard Moniac/Johanna Elberskirchen at the cemetery Rudolf-Breitscheid-Straße under special protection.